Based on Bloomberg (see Table 1), Best World trades at 10.8 times and 11.3 times FY19F and FY20F earnings respectively. This compares favourably with the sector average of 17.1 times and 14.2 times FY19F and FY20F earnings respectively. Its 10.8 times FY19Fearnings is also low vis-à-vis its 10-year average price-to-earnings (P/E) of around 28.2 times. Furthermore, Best World trades at 3.6 percent FY19F dividend yield as compared to its sector average of 2.8 percent. Based on its 4Q18 financial statements, management mentioned that there will be a full year contribution from its Franchise model in FY19, as opposed to zero contribution from this segment in 1H18. In FY18 statements, management mentioned that they are cautiously optimistic on stronger profit and revenue growth in FY19 vs FY18. Besides the Franchise segment in China contributing an entire year of contribution this year, management also expects underlying demand for its products to increase Taiwan, Indonesia, Singapore and certain other markets. Company has proposed a final dividend of $0.05 / share to be ex in May after the approval in AGM. For the entire FY18, Best World has distributed / proposed a total dividend of $0.074 / share, translating to 56 percent pay-out ratio and 4.2 percent dividend yield at current price $1.76. It is noteworthy that total dividend distribution since IPO amounted to $115.3 million. Management has been frequently buying back their own shares, especially on dips. 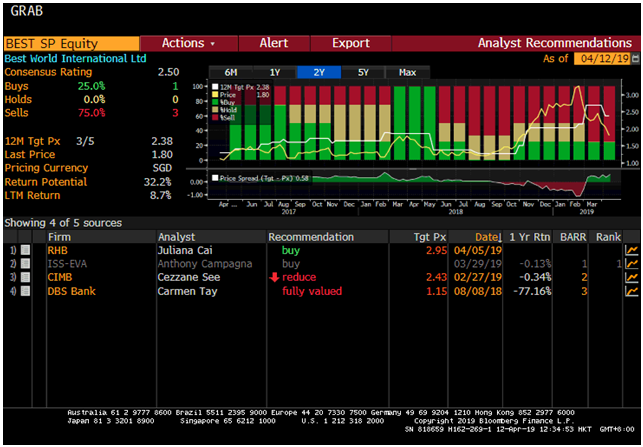 The recent share purchases by management after the Business times article and CLSA report and before the release of its independent report and its upcoming 1Q19 should instil confidence (at least to me). Based on Figure 1 below, it is evident that analysts have mixed views on Best World. CLSA maintains its sell report on Best World with an upwards revision in its target price from $1.29 to $1.75. It is concerned about Best World’s sales in China which may be unsustainable and may drop from FY2020 onwards. Its basis is that its online search on Best World’s Dr Secret products yields a lower online ranking than their peers. To this, Best World has elaborated on their digital marketing in China (click HERE) for more information where it emphasises that digital marketing is only one of several means to attract customers to purchase its products. On the contrary, RHB maintains its buy call with an upwards revision in its target price from $2.13 to $2.95 after Best World’s 4Q18 results. Average analyst target is around $2.38, representing a 35-percent potential capital upside. Based on Chart 1 below, Best World’s chart seems to be on a short to medium term downtrend with short- and medium-term moving averages (MA) moving lower. For the long-term averages 200D exponential MA is flattening. Amid negatively placed DIs, ADX has started to rise and it last trades at 38.2. RSI last trades 27.1 on 12 April 2019. It is noteworthy that Best World typically rebounds when its RSI reach between 24 – 26.7. Indicators are weakening with RSI, MACD, MFI, OBV all trending lower. There is strong volume today and it is good to see whether the selling pressure will exhaust itself soon. On balance, chart looks weak but oversold pressures are building. A sustained close below its 200D SMA (currently around $1.96) with volume expansion is bearish. As per what I have highlighted in my September 2018 article, I am not extremely familiar with Best World’s business, especially when it operates in various overseas markets. Furthermore, I have no direct access to management. Readers who wish to know more about Best World can click the link HERE for the analyst reports. Some brokerage houses such as CGS-CIMB Securities, OCBC Securities, Phillip Securities etc. have online restrictions on Best World. This means clients who wish to trade Best World must contact their brokers to execute. For CGS-CIMB Securities, clients who wish to buy in excess of $100,000 have to put in cash upfront. To a certain extent, such restrictions undoubtedly contribute to weak sentiment in Best World. It is noteworthy that Business Times has published an article on Best World on 18 February 2019 where it raised some questions on Best World (Best World fell 16.6 percent on the day the article was published). Best World has answered the points raised by the Business Times article via a detailed write-up. It has also appointed an independent reviewer (as mentioned above). However, sentiment in Best World continues to be shaky, possibly compounded by the recent sell report by CLSA. Best World is an extremely volatile stock. 52 week high/low are $3.33 and $1.14 respectively. Thus, its volatility has to be taken into consideration for position sizing and may not be suitable for most people. I usually avoid initiating long positions in non-blue chip stocks before their annual reports are published, as auditors may sometimes have queries after auditing the full year results. With the recent insider purchases and company buybacks, I (may be wrong) am willing to take this calculated risk. P.S: I am vested in Best World and have highlighted it to my clients. Do note that as I am a full time remisier, I can change my trading plan and trade in and out to capitalize on the markets’ movements.